Good Morning and Happy Monday to you all! Hope you enjoyed a very happy Halloween this past Friday. is hosting her first blog hop party and has asked yours truly to be one of 12 featured bloggers. Me really??? Pinch me, toss cold water, wake me up cuz I seriously must be dreaming!!! I have been following Sherry ever since I started blogging 3 1/2 years ago and I love all of her content. She is one creative lady and has even been featured in Romantic Homes magazine. 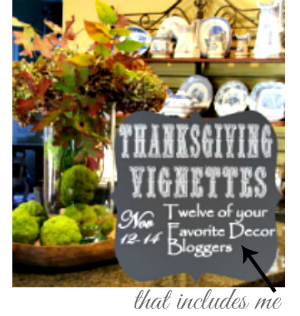 Sherry's party is all about Thanksgiving, so each day she will be featuring 4 bloggers' holiday vignettes, tablescapes and outdoor decor. I am absolutely thrilled beyond belief about being part of such a fun 3 days. So please write down these dates, or better yet grab the button from my sidebar and place it on your blog, to remind yourself to stop on by and check out the amazing creativity that will be going on. In the meantime wishing you a marvelous Monday! Oh how exciting Barbara, I love theme parties and Tksgiving would be a favorite. I am already thinking of my table idea this year and it will be with blue and white transferware as I have never used them for this holiday before! Have a wonderful week and thanks a lot for the shout out! I'm sorry hon...did I call you Barbara? Hope so! Barbara, Thank you for all your sweet words and for helping me promote the blog hop! I am very excited that you are participating and look forward to seeing your vignette. I love your site and I love to see what you post. I cannot wait to come back and see all the great links! Congrats!